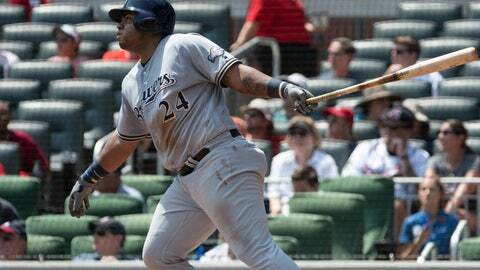 Instead, Atlanta stayed close despite being outhit 19-9 and took advantage of Ozzie Albies’ tiebreaking homer in the seventh inning to beat the Brewers 8-7 on Sunday. Albies’ homer was one of three hit by Atlanta. Ronald Acuna Jr. and Dansby Swanson added two-run shots for the Braves, who took two of three in a matchup of playoff contenders. The Brewers’ inability to deliver with runners on base reached a peak in the seventh. Facing Jonny Venters (2-1), Ryan Braun hit into a bases-loaded double play to end the inning. Brewers: RHP Kyle Davies (right shoulder) will join the Brewers in Chicago, but will make at least one more minor league rehab start after permitting four runs in five innings for Double-A Biloxi at Tennessee on Saturday. … RHP Taylor Williams (right elbow) had what Counsell called a “positive” bullpen session and could come off the 10-day DL without a minor league rehab. … C Manny Pina left the game one inning after being hit by Freddie Freeman’s foul tip in the fifth. Braves: RHP Touki Toussaint is expected to be recalled from Triple-A Gwinnett to make his major league debut in the first game of Monday’s split doubleheader against Miami. Toussaint, 22, joins Mike Soroka and Kolby Allard as first-time starters for Atlanta this season. RHP Mike Foltynewicz will start the night game.